(L-R) Assistant Chief Maintenance Engr. Rogelio Bonoan, MPP Engr. Ronalie Pelotos, and Road Inspector Engr. Edgar Cuenco at a road section along Calbayog-Allen Road. CALBAYOG CITY – The Department of Public Works and Highways Samar First District Engineering Office (SFDEO) obtains an 88.05% rating in its compliance with the guidelines on the maintenance of national roads and bridges for the first semester of 2018. Engr. 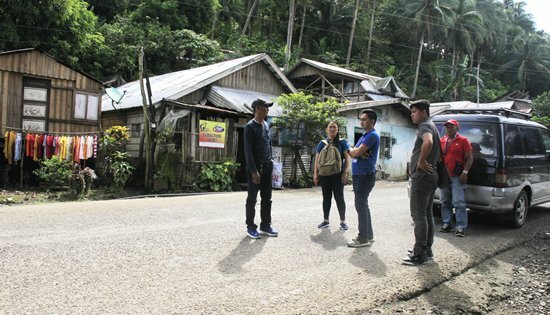 Edgar Cuenco from the Department’s Bureau of Maintenance conducted the road rating inspection and validation last February 2018, inspecting a total of 144.80 kilometers of paved road, divided into 101.2 kilometers of asphalt roads and 43.6 kilometers of concrete road. The 88.05% road rating, which was released just this month, is higher than last year’s overall rating of 87.4%. “Public safety is the primary priority in maintaining our roads and bridges. This semester’s accomplishment is a testament to the continuous efforts of our maintenance point persons and their teams who have tendered services beyond the regular working hours just to ensure safe and well-maintained roads for the travelling public,” said District Engineer Alvin Ignacio. Currently, SFDEO is gearing up for the next semester’s road inspection and validation and is looking forward to surpass this semester’s rating.